#NoGroundToLose - Real Food Action Report! In December, we united around a declaration that we have No Ground To Lose in the struggle for a just and sustainable food system. Family farmers can’t wait for it to become more convenient for our institutions to invest in them. Fishers and ranchers can’t wait either - their livelihoods are increasingly threatened by industry consolidation on land & sea. And none of us can wait for healthy, just food to be accessible for everyone. (1) Yesterday, Ohio University students and Coalition of Immokalee Workers allies marched from campus to Wendy's to their President's office - drawing the connection between the struggle for farmworker justice and for real food. Fair food is real food! They attempted to deliver a letter to Wendy's, urging they sign on to the CIW's Fair Food Program, and delivered a letter to their President urging a campus commitment to real food! (2) Last week, Real Food University of North Carolina-Chapel Hill also drew attention to farmworker justice through an "inconvenient gift" delivery to their President: a dollar bill in 3 pieces, representing that for every dollar in the food system, 71 cents goes to the corporate food system, 23 cents to farmers, and 6 cents to farmworkers. They wrote a powerful letter to their President about how supporting REAL FOOD means supporting fair prices and fair wages throughout the supply chain. (3) After a rally, Real Food Ohio State and supporters were escorted from their President's office by police while attempting to schedule a meeting for President Drake to finally respond to growing student and community support for the Real Food Campus Commitment at OSU. Local students and allies took powerful action with students from across the region joining them as part of the Regional Action Training. Wearing symbolic clocks, they marched into the President's Office and one by one delivered messages of why there is "No time to lose" for OSU to support a real food system! Real Food OSU rally outside President Drake's office, and delivering messages to Drake after marching inside to his office. (4) Real Food UMaine got front page coverage for their valentines delivery to their President - they implored President Hunter to show the love for Real Food for UMaine, and not let corporate food be her valentine! Real Food UMaine asked President Hunter: "Will you show us real food love, or will you let corporate food be your valentine?" (5) Real Food campaign crews at University of Georgia, University of Minnesota, University of South Carolina, Indiana University, and Ohio State also delivered valentines and other gifts to their Presidents - asking for real food LOVE and response to their campaigns for Real Food! Real Food University of South Carolina Chapel Hill collected valentines from local farmers at the farmers market, and delivered them all to their President - will he show the love for real food and South Carolina's food system? (6) The Real Food Initiative at University of Michigan has collected video letters to their President urging support on the many issues that demand urgent action to support real food! In addition, this spring we are in the fight for global food sovereignty around the world by taking action against the Trans-Pacific Partnership! Despite the signing of the TPP on Feb 4th, it cannot go into effect until it is passed through Congress. The vote was intended to happen this month, but because of all of the organizing across the country, it appears that there is not a majority in Congress. The vote has been pushed off until at least May, if not November or into 2017. That means action is working! The longer we can delay this dangerous deal, the better chance we have of defeating it! (1) At the California Regional Action Training in Santa Cruz, students marched to Representative Farr’s office, demanding that he oppose the TPP. A delegation of students went into his office with a letter -- we are awaiting response and will keep pressure on him! (2) At the Mid-Atlantic Regional Action Training in Baltimore, students planned an action to pressure Rep Cummings to oppose the TPP. But he surprised us a few days before the action, agreeing to vote against the deal! So we held a “thank-you rally” and heard from community speakers about how this deal could impact people in the city of Baltimore. 5 students delegated the Rep to take leadership on the issue and lead a letter from all the reps in Maryland opposing the TPP. We are continuing talks with his office this week! (3) At the North Carolina Regional Action Training in Chapel Hill, students did a teach-in to learn about the TPP and called into their representatives, urging them to vote against the TPP! The group from the University of South Carolina returned to campus and gathered more than 100 Valentine’s Day cards, urging Representative Clyburn to break up with the TPP! 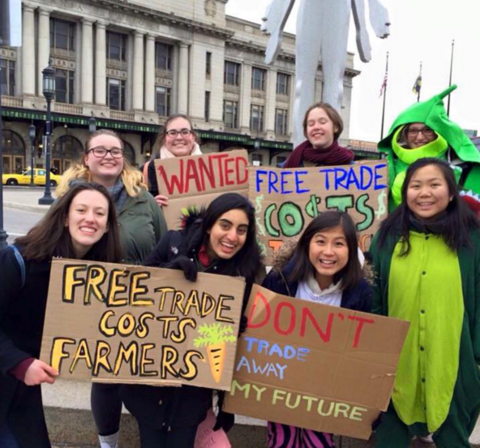 RFCers at Grinnell College, Stonehill College, and University of Vermont delivered hundreds of Valentine’s Day cards to their representatives last week, showing love for FAIR trade not free trade!